The dominance of competitive business environment is compelling the organizations to devise ways to control cost and improve efficiency. Organizational effectiveness has become much larger a challenge to deal with especially in the last few decades. The role of HR is becoming crucial and for sustaining organizational performance, improving workplaces and retaining talent is the key. In these times Dr Deepak Malhotra brings out this volume which is based on his primary research and personal experiences to raise and answer some of the key questions to deal with employees at the workplaces and to transform these workplaces into happy workplaces. I share my concern on employability with the author. We are in different times and we need to develop the workforce to deal with challenges at the transforming workfronts. Employees have to develop an attitude to respond to the call of time. The figures on employability of our youth are really shocking. All of us have this challenge to deal with. Employee Engagement has caught the attention of HR academicians and practitioners and in that continuity this book is able to attract the attention to look at the concept from a different angle. One cannot have same yardstick to measure the performance of all the employees. Similarly organizations cannot have same process of engaging the employees of all ages. This is the basic premise of the book which provides an impressive account of his research findings as well as prescriptions to the managers to follow certain paths to respond to the needs to the workforce. Their needs are different and so should be their responses and remedies. 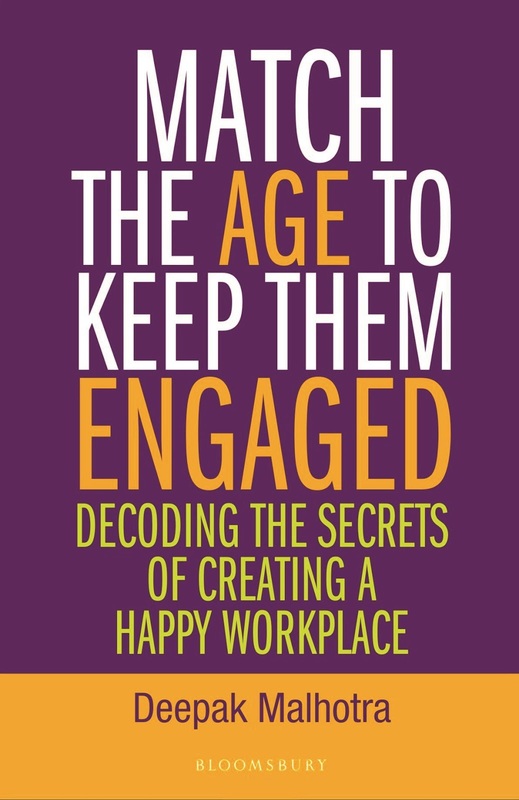 The book begins with the research procedure and key findings which further leads the way to suggest measures to improve work environment through effectively engaging employees based on their age. There seems to be no difference in the degree of engagement so far as gender is concerned however number of years spent in the organization show difference and till one spend around 5 years, the number of engaged employees seem to grow. I find it quite interesting to note that after spending around 5 years in an organization the number of engaged employees start falling. This makes lot of sense and as a student of HR, I feel it could be because of the gap between expectations and the experiences. At mid-level it occurs to employees in general. Deepak divides the workforce in the brackets of the age groups 46 years and above (Baby Boomers), 31-45 years (Gen X) and up to 30 years (Gen Y). The generation below 30 years of age is considered as One click generation comprising of Gen G (12 to 18 years) and others as Gen I. His concern for all the brackets is well placed and his articulation and tenacity to look at the need, expectations, exposure of One click generation is very apt. He suggests different ways of engaging them as the needs of these employees are different. This is unique aspect of his research and it makes lot of sense when one goes through the suggestions. 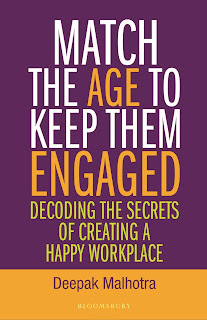 'Match the Age' in the title of the book is based on this finding and a sizable part of the book is devoted in explaining and suggesting measures to increase the number of engaged or fully engaged employees at different levels. His personal experience in different organizations add value to the suggestions as well as to the whole volume. As the author mentions, in India only around 9-10 percent of employees are fully engaged as against 15 percent as per global standards and globally around 25 percent are disengaged as against 30 percent in India. These figures pose a challenge to HR department. HR has to be considered as line function in order to increase the number of satisfied employees and thereby fully engaged workers. As argued by Vineet Nayar in his book on EFCS, one has to prioritize employees over customers to win over customer satisfaction. Only engaged employees can effectively engage customers. The mention of entrepreneurial leadership is very frequent in the book which speaks of the author’s intention to assure engagement of employees through creative ways of leadership. This is very important in the present day organizations and the lack of effective leader is driven by this fact that mostly they do not possess the ability to take risk and lead creativity. Deepak has successfully dealt with this aspect of leadership and narrated several personal incidences. His interest in cricket and Indian movies is well reflected through the writings in the boxes and their relevance with the theme of the book 'Keep them Engaged'. Though EE has been criticized as nothing new and old-wine-in-new-bottle experience, it has been able to convince the academicians as an area of further exploration and an activity worth pursuing by the organizations to improve decision making, follow participative management and to win over employees through their active involvement. It also leads to create a feel of freedom, choice and commitment for employees to perform their best. If you ask me, I have never seen one person in the last two decades, who has been satisfied with his/her current remuneration. Then why do people stick with reputed brands like TATA, even when they pay lower than the competitor? (p 137). Though the book may not have academic rigor in its approach, it makes a good read for practicing managers. I recommend it to all who are interested to find ways to improve employee engagement and further to them who play strategic role in devising HR strategies towards attaining and sustaining organizational effectiveness.